Remember when I said I would never make a cake? Well, I lied. I made you a cake. 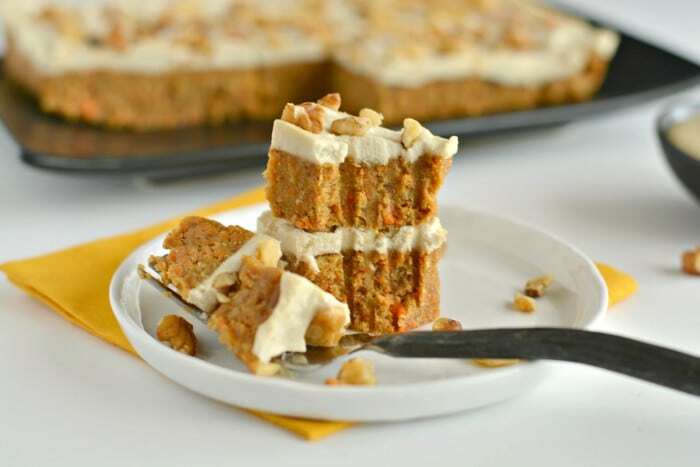 If there’s one thing that will bring me to my knees (other than chocolate of course), it’s carrot cake. In fact, if a guy wants to win me over on a date then all he needs to do is bring me carrot cake. I would take carrot cake any day over chocolate. Okay, so maybe not any day. I would still gladly accept chocolate anytime. But there’s just something about carrot cake. Maybe it’s the carrots. Maybe it’s the coconut. Maybe it’s the sweet cinnamon-y bread. Or maybe it’s that sweet, sweet vanilla icing. Whatever it is, carrot cake is what my dreams are made of. 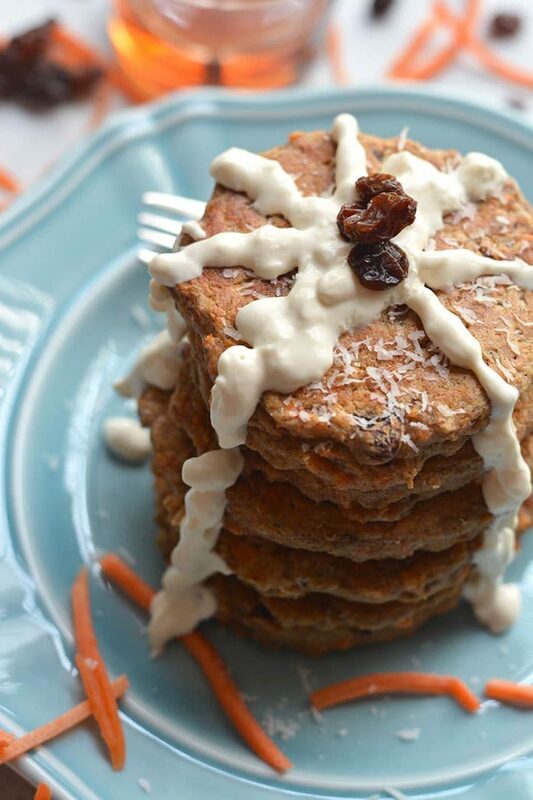 The thing about carrot cake is that it’s a lot harder to make healthy than you think. I should know. I’m pretty sure I’ve made at least 50 different versions of carrot cake for months and have never been able to get it just the way I wanted. Don’t get me wrong. They were all good, but none of the versions turned out the way I imagined in my head. You know when you have something in your mind a certain way and everything else is just well, okay? Because not only am I a perfectionist, but I also have to get whatever it is just right before it meets my expectations. Finally I gave up on making a “cake” and thought what if I just made the base out of walnuts and dates? 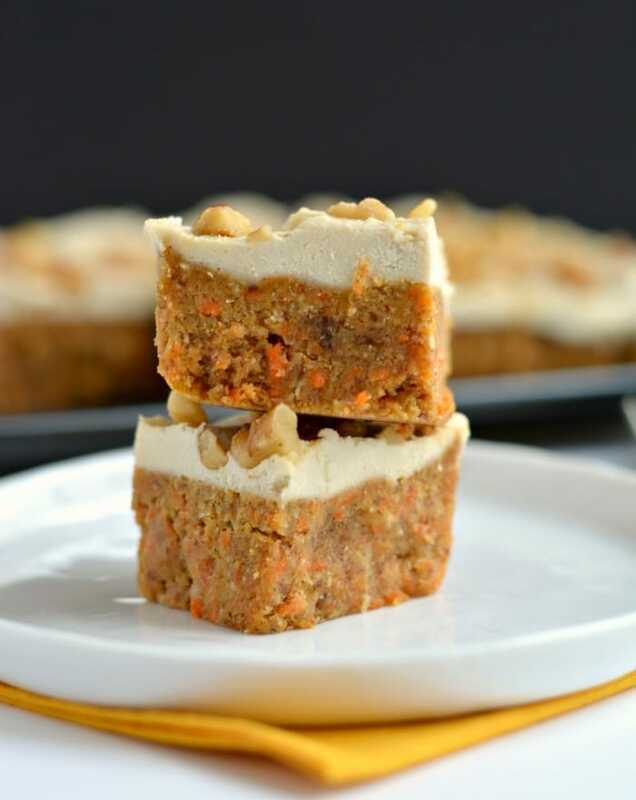 Enter Raw Carrot Cake. For the icing I wanted something lighter and with less sugar, but that was healthy. I know, I was asking for a lot here! So sticking with the raw theme, I knew I wanted to blend something with soaked cashews to get the consistency I wanted but that something was the question so I slept on it, went to the gym and the next morning it came to me. Coconut milk! After my workout, I picked up the coconut milk and blended it with the soaked cashews, some almond extract and maple syrup and voila! Best. Icing. Ever. It’s just the way I wanted it. It’s thick and lightly sweet, but not overly sweet. I actually doubled the icing so I could dip Raw Carrot Cake into it. Something I highly recommend by the way! 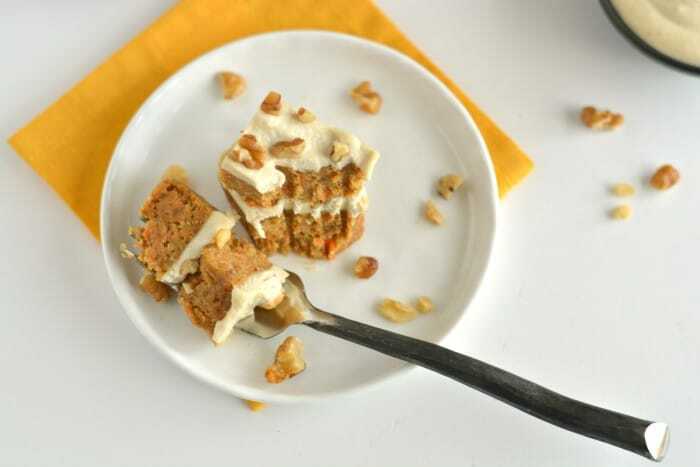 This Raw Carrot Cake is guaranteed to win any heart. It sure won mine! I’m already on my third batch and I have no guilt eating it either with all it’s healthy ingredients. 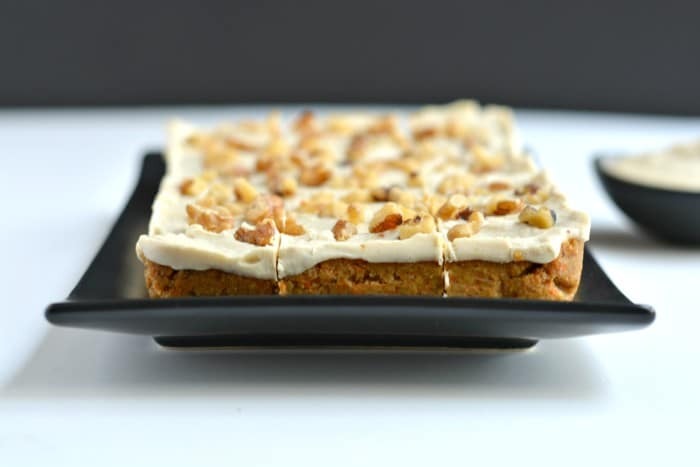 Maybe one day I’ll make a plain old, regular carrot cake but until then, Raw Carrot Cake it is! To make the base, mix dates in a food processor until it forms a paste. Break up the paste into a few chunks to spread it evenly throughout the food processor. Add the walnuts, carrots, ginger, nutmeg, cinnamon, coconut flour, coconut oil and coconut flakes together to the food processor with the date paste and combine until mixed together. Line a loaf pan with parchment paper vertical and horizontal so you can pull up the cake easily once set. Place the base mixture in the loaf pan and place in the freezer while you make the icing. To the food processor, add soaked cashew, coconut milk, maple syrup, almond extract and coconut oil. Blend until a silky smooth icing forms. Remove the loaf pan from the freezer and using a spatula spread the icing over the base covering all the corners and edges. Sprinkle with walnut pieces and gently push into the icing with your finger to secure. Place the loaf pan back in the freezer, 4 hours minimum (overnight is best). 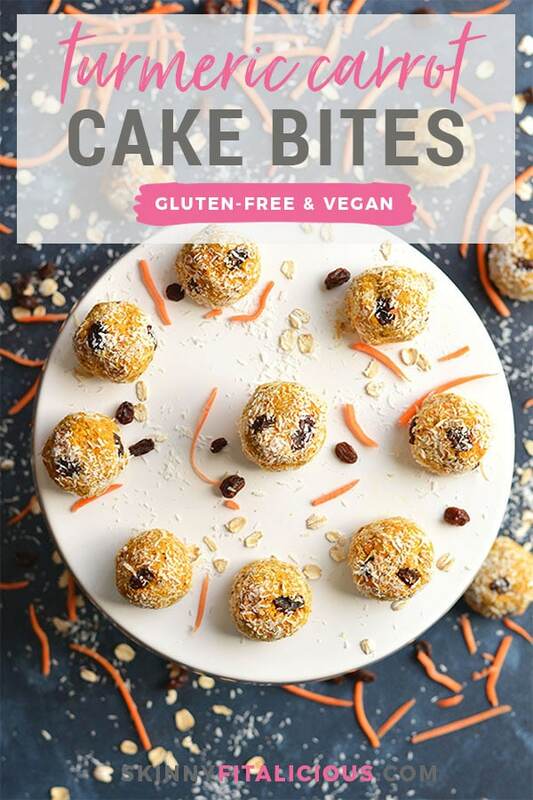 Remove and slice into 16 mini carrot cake bites. 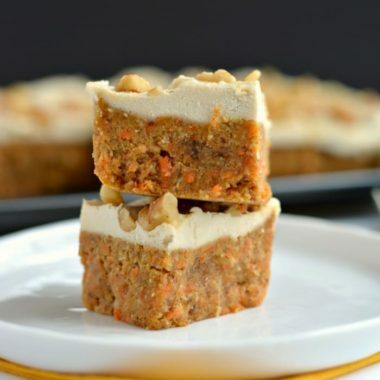 Keep carrot cake bites in a container in the freezer. Soak cashews 3-4 hours, for best results soak overnight. For a sweeter icing, add 1-2 tbsp more of the maple syrup. 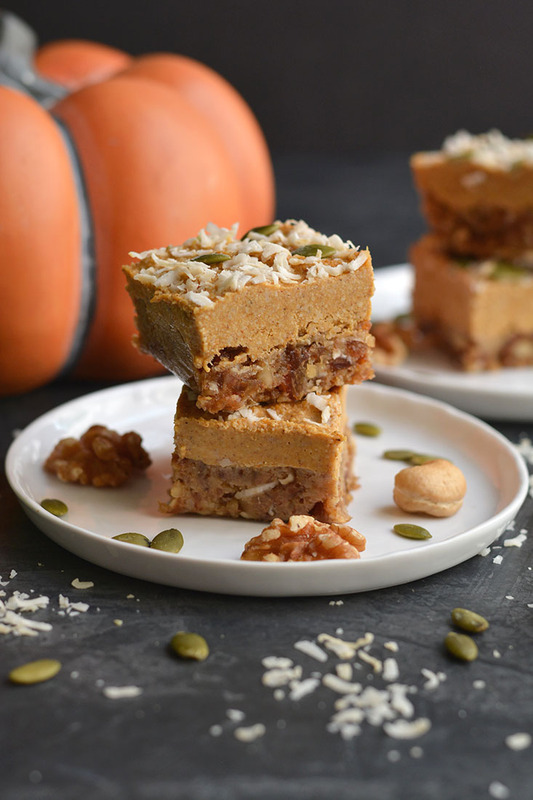 If you love this recipe, also see my Raw Pumpkin Pie Cake. Substitutes for dates include: figs, dried raisins or cranberries. No other substitutes have been tested with this recipe. For those who believe dates have too much sugar, remember the sugar in dates is balanced with fiber which is key with any high sugar food. Unless you are diabetic, there is no need to avoid dates. Gahhh!!! I’m seriously drooling over this “cake”!!! It’s so dense and sweet and filling, I’m sure! Love all the great nutrients in it! This reminds me of the carrot version of the cranberry bliss bars that starbucks has at Christmas. I used to be so perfectionist. Then I had calculus. That cured me. Oh my goodness, this looks dreamy. I’m in love with the ingredient list, too. This is genius. Totally genius 😉 Pinned! Oh my goodness!!!! This looks sooo good!! I love dates! and I love that you used so many ingredients I already have on hand!! Will definitely be making this!!! This looks absolutely perfect and I’m dying to trying it! The icing especially! Oh you will love it Michele! O well this is a cake I would gladly eat! Carrot cake is my favorite thing..ever! This looks amazing!! 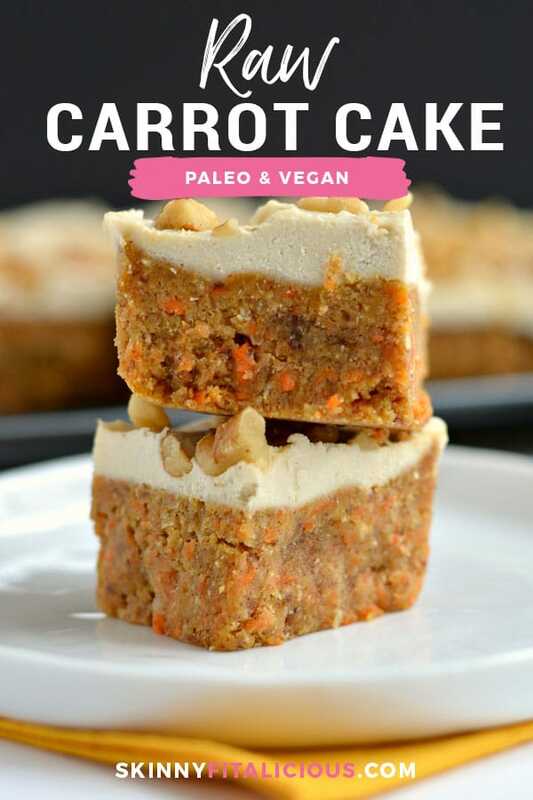 I can’t believe it’s raw, it looks so much like real carrot cake! Haha! Thanks, Sarah! I’m hoping the Easter bunny brings me more walnuts so I can more of this. This looks so good! And packed with healthy ingredients and fats too! This looks like it would be a great afternoon snack that would satiate my sweet tooth and actually keep me full until dinner (not an easy task haha…)! It’s not overly sweet, but just sweet enough to tame a sweet tooth. You will enjoy this! Oh man… I knew this was going to be good when you teased it last week. I’d down this whole thing in like 5 mins! I love chocolate cake, but carrot is a verrrrrry close second. Thanks Laura! FYI – it’s the best right out of the freezer. 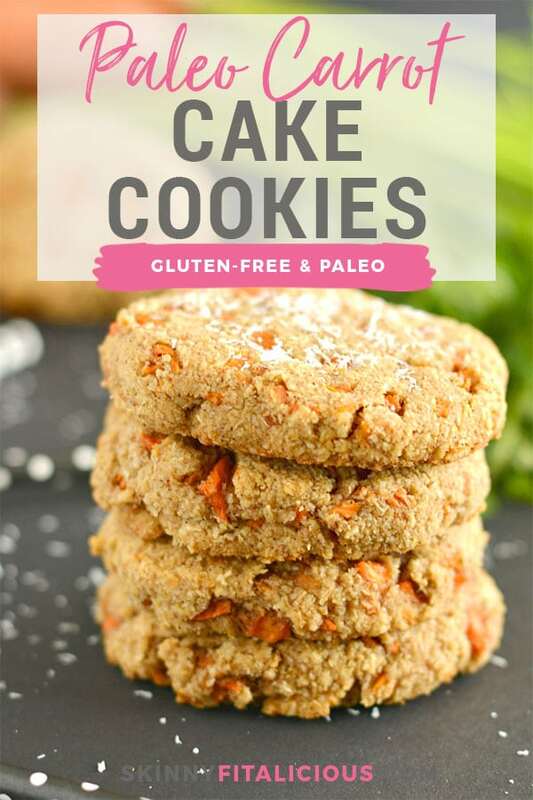 Ok..Somehow on my Bloglovin App, I saw this recipe this past weekend and I just made it–And it’s AMAZING! It somehow published yesterday morning by mistake. I swear WP has ghosts. BUT YEAH! I’m so excited someone loves it as much as I do. I’ve never made raw cake before because I thought it would be too hard but you totally proved me wrong! This looks so easy and delish! Carrot Cake all the way! It’s as easy as putting everything into a food processor. Haha! I love love love carrot cake. It’s on the menu for the “final meal of my life” – if I get to choose it! This makes it accessible and less of a “treat”. Yum! I love it…final meal of my life! I hope I get to choose to. I DID & it’s pretty great if I do say so myself! I definitely need to try this! Yes, not even carrot cake comes out nice but this one looks like a charm! Thank for sharing this fantastic recipe! Thank you! Hope you love it. Can you help me out with an alternative for dates and maple as i’m on a sugar free cleanse at the moment. I can use stevia but no fruit or anything that produces sugar in the body. I would looovveee to make this!!! The dates are necessary. They hold everything together with their sticky consistency. There really isn’t a substitute for that. You may want to try almond butter with stevia, but I have no idea if that will work. I’m surprised you can still have stevia on a sugar cleanse. Stevia has the same affect on the body as any other sugar. Raisin is the best replacement for dates. It helps for the sticky consistency as well. How do you soak the cashews, in what? You don’t thaw it. You slice and eat frozen. Hmmm did that and it is like having a frozen carrot block in your mouth. I can’t say specifically how long it will take because it depends greatly on your climate and the the time of year too. I live in Arizona so things come to room temperature within minutes. Maybe you need to freeze for a shorter period of time or let it come to room temperature for awhile. It shouldn’t be hard as a rock. It should be soft. You’ll have to use your own personal judgement here. Thanks for the tips on your recipe. I did manage to use my own personal judgement in the end. Thank you so much for pointing me in the right direction. Unbelievable !! Thank you so much my daughter needs to have a Paleo diet and this makes her is and her therapist so happy just to have a little sliver of this cake is heaven !!! Thank you for being such a perfectionist !!!!! Isn’t it amazing? Glad she liked it! I made this today. So amazing! Thank you. Glad you liked it! One of my personal favs. I made this exactly like the directions. I tasted the base…AH-mazing… before putting it in my loaf pan. I just made the icing…AH-mazing. And now I have to WAIT four hours for it to set up in the freezer. This is going to be hard. Thanks for a wonderful treat. I love this and I will be making it and sharing it often. Walnuts are gross. Any substitutions?? Well, you can omit them from the top. The walnuts in the crust you can’t taste. You could try almonds. I haven’t tried it, but I’m guessing the consistency would work with a similar flavor. 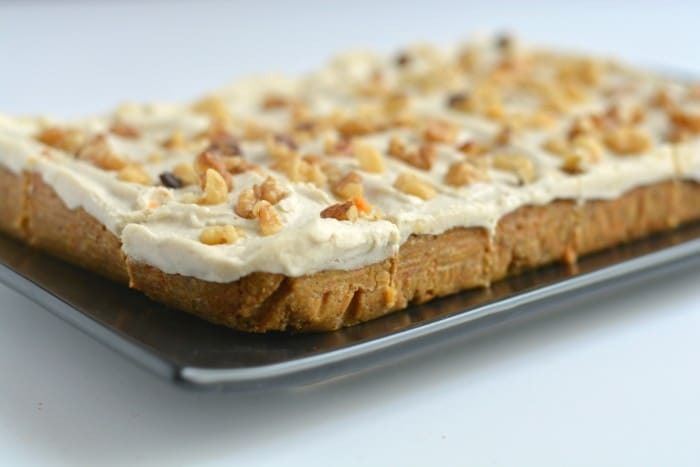 Unfortunately I’m allergic to cashew nuts…can I use almonds and get the same result for the topping? It’s unlikely almonds or any other nut would work. They don’t get creamy when soaked in water the way cashews do. Have you ever heard of aquafaba? It’s the water from canned garbanzo beans. 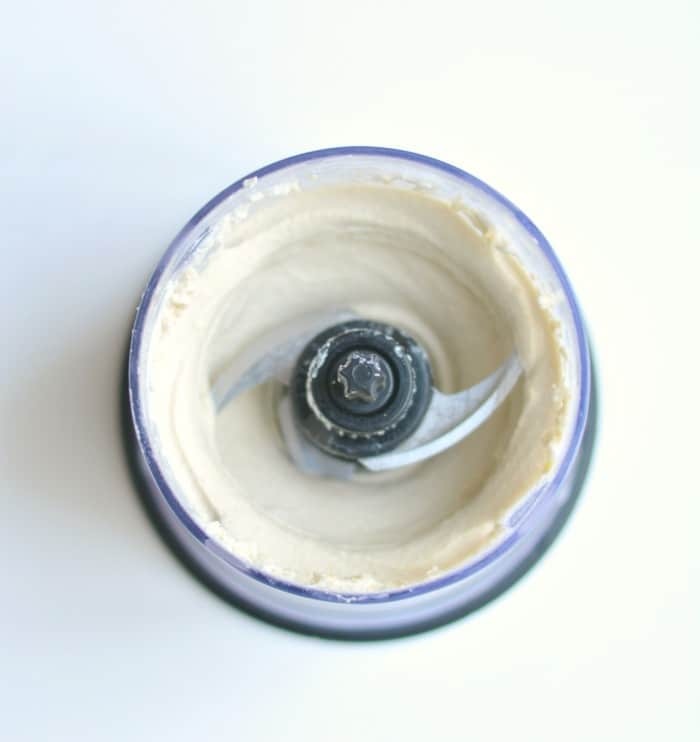 If you whip it up for a very long time it become a cream like substance. Coconut cream may be another substitute. I haven’t tried any of these, but I’m guessing they would work. Could I make this in a large round tin so it is like a raw carrot cake cheesecake? If so would I need to double the recipe? I haven’t tried it, but I’m guessing you would have to. Not sure why, but my icing looks nothing like the pic! What kind of coconut milk did you use? I used Pacific Organic that comes in a box. Was I supposed to use the thicker kind in a can? I used the regular kind of out of a carton. The icing get really creamy from the soaked cashews not the coconut milk. Weird. I’ve had tons of people make this and love it. You’re the only one who’s ever mentioned it. Awesome! So glad you liked it. Yeah, the crunchy topping isn’t necessary. What can I use instead of coconut flour, and what would be the amount needed for the substitute? I have not tried another substitute. You could try almond flour, but I’m not sure on the amount. It’s hard to say because the consistency of coconut flour is very absorbent. Although, nuts and coconut products (flour, meat, oil) have some very impressive health benefits, ie: coconut oil can increase metabolism, reduce hunger and boost HDL (the “good”) cholesterol, there are limits to how much fat should be consumed on a daily basis. And although medium-chain triglycerides may boost metabolic rate slightly, eating more calories and fat than needed could still lead to weight gain. At 180 calories per bar, 65% of those calories come from fat, 50% of which are saturated and then add 8 gms of sugar to that. I am confused. Is this really considered a healthy option? Yes, it is a healthy option as long as there is no health status requiring fats to be limited. There’s only 5.7 grams of saturated fat. Anything less than 5 per serving is the general recommendation. The sugar is natural sugar balanced by high fiber which means there’s very little blood sugar spike. Furthermore, those wanting to lose weight should be eating higher fat and protein diets. 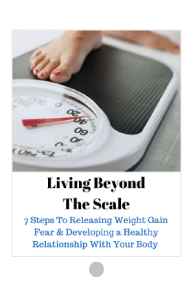 If someone eats above their daily caloric requirements sure they will gain weight; however, there are plenty of studies showing that it’s more than just calories when it comes to weight loss. 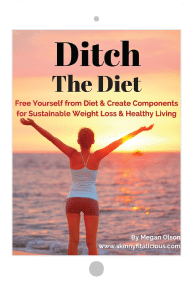 The belief that high fat diets causes weight gain is an old one. Macronutrient content and timing is actually more important. My boyfriend requested carrot cake for his birthday so I made him a traditional cake with all the bad stuff. I didn’t want to be tempted while everyone was eating cake so I made these as well. I think I’ll like them more refrigerated… they were very frozen. But the flavor was good!